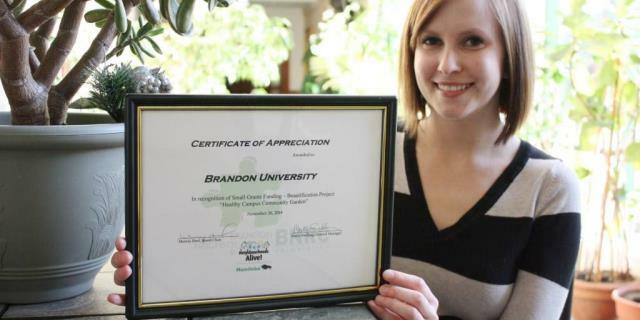 BRANDON, MB – An urban garden project spearheaded by students at Brandon University (BU) has been recognized as a top community-building initiative. 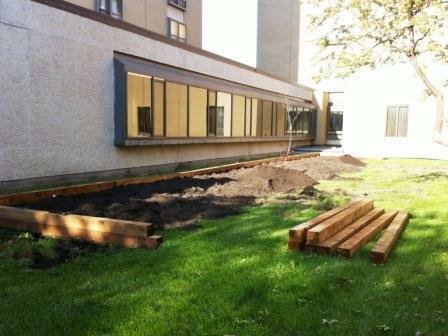 The Healthy Campus Community Garden was deemed the best beautification project in 2014 by the Brandon Neighbourhood Renewal Corporation (BNRC), which awards leading ventures in the categories of youth, community, culture and beautification. 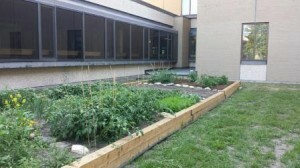 “We grew potatoes, carrots, tomatoes, beans, spinach, lettuce, squash, cucumbers, herbs including parsley and dill, and even flowers,” says nursing student Karli Maduke, who accepted the honour on behalf of students, staff and one University retiree who volunteered to build and tend the campus garden. Youngsters from the University-operated daycare even helped. “People loved it,” says Maduke. “They really enjoyed the experience, and want their plots again next year.” The 70’ by 12’ garden patch was constructed on an unused sliver of ground surrounded on three sides by campus buildings. Fresh produce was donated to the students’ food bank and used in the University’s cafeteria. The Community Garden was developed through BU’s Healthy Campus, a multi-year project to investigate students’ health and well-being, and generate sustainable, healthy, community-driven solutions.